Green Leaf Capital Partners has developed a very focused strategy within the multifamily residential sector: Class A/B suburban apartments. Green Leaf focuses on affordable apartments within a metro to appeal to a wide range of tenants. They will continue to invest in well-located assets in growing markets. Green Leaf avoids distressed assets, but looks for value-creation through moderate renovation and better management. 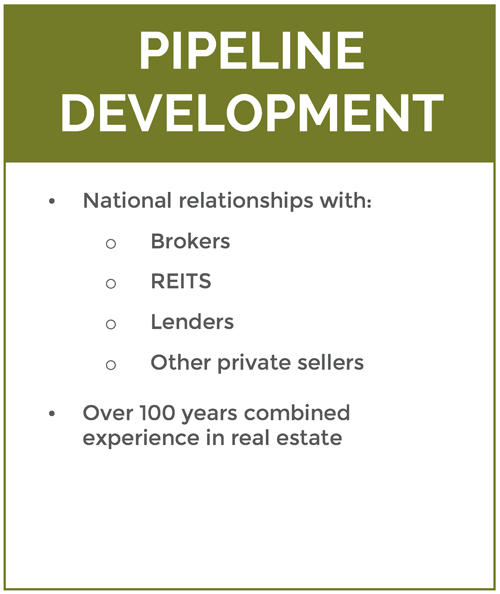 Green Leaf’s deep industry relationships are yielding deal flows in a wide range of appropriate MSA’s. 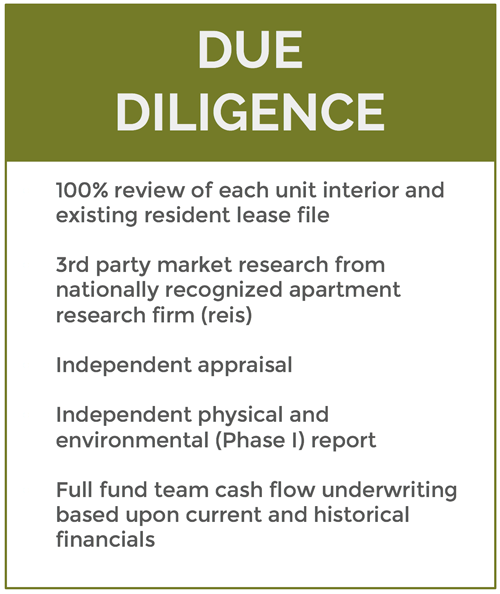 Through Green Leaf’s strong relationships with major multifamily lenders and predictable terms, they have a very accurate and current knowledge of the debt parameters to be used in underwriting acquisitions. These relationships allow them to act quickly and efficiently to acquisition opportunities. Green Leaf Capital Partners uses a disciplined and analytical approach to evaluate potential investments, and they use conservative assumptions regarding future performance to ensure the correct expectations are set. 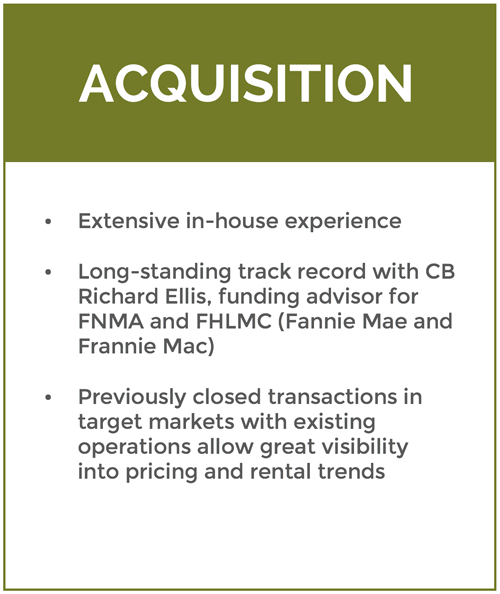 Seeking to acquire properties that generate strong current income and long-term appreciation in all transactions, Green Leaf maintains consistent and rigorous underwriting standards, not “paying up” for assets. They see dozens of potential transactions monthly, but pursue only about 10% to 20% of the deals it reviews. The MSA’s that Green Leaf covers have populations in excess of 40M. The cities have clean infrastructure and high quality of life that continue to attract younger people to settle, and where Millennials and Generation Z populations are key factors. Physical characteristics of properties are class A/B, but tenant profile is Class B, entry-level Millennial/Gen Z, credit-worthy but non-affluent tenants. Suburban Class A/B tenants tend to be in the middle-income brackets, stable but with less mobility than higher-income renters. Employers are looking for less-expensive, younger, educated talent and are migrating to high-growth areas, setting the stage for high job and population growth, which leads to above-average household formation. New supply concentration allows for potential acquisitions of newer properties in markets where owners are challenged due to financing or other capital restraints and need to exit quickly.